Kembang Tahu (tofu pudding with thin ginger syrup) was a snack staple during a rainy day when I was a kid (yes, I snack a lot, stop judging.. K). I even had my favorite Kembang Tahu hawker who peddled around my neighborhood at 4 PM every day. The reason why I love that 4 PM Kembang Tahu hawker was because the sauce he made was gingery enough but not too spicy, it was just right for me. Kembang tahu is a very common and popular soy dessert in Jakarta sold by the street vendor, freshly made each day. Strangely, when I think about it, I have never found it in the menu of any restaurant I have been in Jakarta. But then again, even if I have found one, I’d still prefer to get it from the 4PM hawker, sometime street food is just unbeatable, tastewise and pricewise (it was 30 cents USD per bowl, (circa 2014)!! God knows how the hawker made his profit but I ain’t complainin’). After I moved in to Québec city and often face freezing cold days, I began to crave kembang tahu more and more, like an orphan craves for a hug from a mother, like a student in Maths class craves for the bell to ring, like a cow craves for feeding from a grassland after a long winter, you get what I mean. 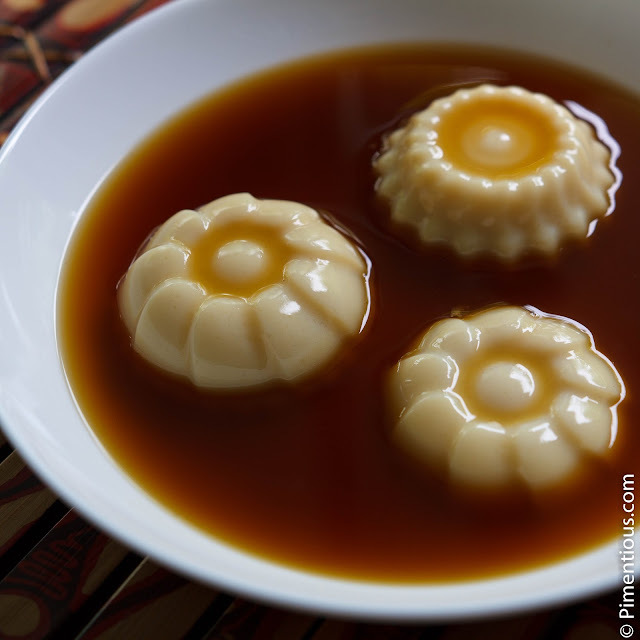 The softness of the tofu, the sweet smell of the soy milk, and the warmth of the caramelly ginger syrup are unforgetable. Unfortunately, my mom has never made it, we always had it from the vendor, so I have no slight idea how to make it and I was convinced that this dessert is complicated to make. After consulting my reliable life coach and consultant, Sir Google, I learnt that kembang tahu is not originally from Indonesia, in fact it is a china cuisine called Douhua (https://en.wikipedia.org/wiki/Douhua). The recipe to make it is all over the internet. However, the ingredients needed to make the recipe freaked me out a wee bit; it uses gypsum powder. You see, whenever I hear gypsum, the things come to my mind is either ceiling, construction blocks, plaster, or body cast for broken bone. After collecting my jaw from the floor and get over the thought that I have been eating gypsum pudding with ginger sauce, I managed to get myself together and understand that there is food-grade gypsum (calcium sulfate) which actually acceptable for human comsumption as a dietary source of calcium and widely used as coagulant in traditional tofu making. It is also used in beer making, bread, ice cream, and other food. Gypsum, I am cool with you.. The next thing on the list of ingredients is soy milk and they encourage you to make your own soymilk. There are tons of DIY soymilk recipe out there and almost each of them says making your own soymilk is a life changing experience. I am sure they are true and your DIY soymilk will taste like out of this world, but right now I dont need a life changing experience, I need Kembang Tahu. So today I am cooking Kembang Tahu using my rule of life: Simplificationisme. For the pudding, basically you can use any pudding, agar agar, or jelly agent of your favorite, cook it with soybean milk. Follow the written cooking instruction. Turn off the heat and pour the jelly mixture into prepared molds. Let it cool and set. 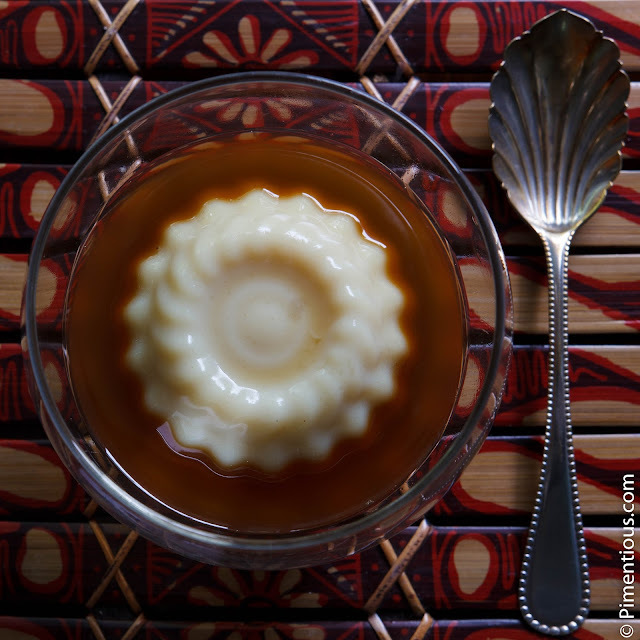 This pudding can be served warm or cold, depends on how you like it (in my case, it depends on the weather). I don't know if I can find Nutrijell at the supermarket but if I can't, I will try this recipe with plain Jell-O or agar powder. Thank you for sharing the recipe!